Artist's concept showing the 77-ton configuration of NASA’s Space Launch System rocket launching into space. The proposed NASA budget for the 2017 fiscal year, $19 billion, has evoked mixed reactions from government officials and space organizations. White House officials unveiled the Obama administration's 2017 budget proposal today (Feb. 9), and NASA's share came in $300 million lower than the agency's final budget for 2016. The proposed NASA budget would decrease funding of space exploration but add some to aeronautics and space technology and redistribute the science budget. A breakdown of the budget request is available here, and there is also a full summary available. Rep. Lamar Smith, R-Texas, chairman of the U.S. House of Representatives' Committee on Science, Space, and Technology, expressed disappointment in the proposal's allotment to different projects. "This administration cannot continue to tout plans to send astronauts to Mars while strangling the programs that will take us there," he said in a statement. "And the administration once more proposes cuts of more than $100 million to the planetary-science accounts, which have previously funded missions like this past year's Pluto flyby. "At the same time, this proposal shrinks space exploration priorities within NASA's budget; it disproportionately increases earth-science accounts to more than $2 billion — a 70 percent increase since 2007," Smith continued. "This imbalanced proposal continues to tie our astronauts' feet to the ground and makes a Mars mission all but impossible. This is not the proposal of an administration that is serious about maintaining America's leadership in space." However, Rep. Eddie Bernice Johnson, D-Texas, who also serves on the House Science Committee, praised the program overall. "As in past years, the president's budget will help ensure that the U.S. can compete in a 21st century global economy and solidify America's place as a scientific and technological leader," Johnson said in a statement. "The investments in the full range R&D and STEM — including advanced manufacturing research, prioritizing basic research, investing in clean transportation and civil space activities, and education programs like Computer Science for All — are truly investments to help us meet our greatest challenges not only for the year ahead, but for decades to come." Mary Lynne Ditmar, director of the Coalition for Deep Space Exploration, a space advocacy organization, expressed concern. "While we appreciate the funding proposed for the International Space Station and its transportation systems, space science programs — including the James Webb Space Telescope, and proposed deep-space habitat — we are deeply concerned about the administration's proposed cut to NASA's human exploration development programs," she said in a statement. 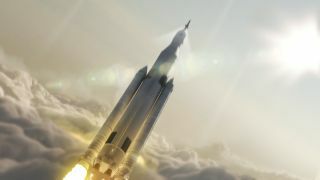 "This proposed budget falls well short of the investment needed to support NASA's exploration missions, and would have detrimental impacts on cornerstone, game-changing programs such as the superheavy lift rocket, the Space Launch System (SLS) and the Orion spacecraft — the first spacecraft designed to reach multiple destinations in the human exploration of deep space," she added. "The greatest challenge to these programs is not technical, but budget stability — plain and simple," Ditmar continued. "At this critical stage, it is important to ensure that the significant progress already made on the development of the SLS and Orion spacecraft continues, so as to meet important milestones, including the first integrated launch in 2018 and crewed missions beginning in 2021. Fully developing these systems will enable the United States to realize its aspirations for human exploration, planetary missions, international collaboration and scientific discovery." Eric Stallmer, president of the Commercial Spaceflight Federation, praised the budget proposal. "I commend the Administration for crafting a budget that provides robust funding for NASA and FAA AST," he said, referring to the Federal Aviation Administration's Office of Commercial Space Transportation. "We applaud the proposals that would enable and utilize private space capabilities to help build a sustainable American expansion into the solar system from the edge of space through low-Earth orbit to the moon and beyond. It builds on the strong foundation established by the FY16 Omnibus and Commercial Space Launch Competitiveness Act. We look forward to working with the Congress to fully fund a number of the proposals in this request, while also championing efforts to shore up areas that need additional input and support." Casey Dreier, The Planetary Society's director of space policy, broke down the proposed budget overall on the society's blog. On planetary science in particular, he said: "Well, we're five for five. This is the fifth year in a row that the White House has proposed cutting NASA's Planetary Science Division. While every other science division at NASA would receive a funding boost in this budget, Planetary Science, the year after flying by Pluto and confirming flowing water on Mars, earns a $110 million cut. "Now, credit where credit is due," he continued. "The request is for $1.52 billion, which, compared to previous requests, is a marked improvement and very much a step in the right direction. We've been advocating for at least $1.5 billion for this program for years now, and it is satisfying to see this number reflected back in the president's budget. "But the fact of the matter is that this program has been underfunded for years and needs to rebuild," Dreier continued. "Congress stepped up and provided $1.631 billion last year, and that number needs to continue to improve in order to position NASA for a spectacular decade of planetary exploration in the 2020s. As expected, most of the cut appears to impact the Europa mission (which would get about $50 million in 2017, down from $175 million in 2016). The administration is sticking with its intent to launch in the late 2020s. The request tones down some of the optimistic planning for the Europa flyby mission set forth in last year's budget. NASA runs the numbers to assume an Atlas V launch, not SLS, though SLS is very much under consideration. "In more positive news, all existing missions are funded through 2017," Dreier said. "That means [the Mars rover] Opportunity can keep on roving, and the Lunar Reconnaissance Orbiter can keep collecting data through the year. No arbitrary zeroing out of mission budgets here."